First off the ferry even ahead of the trucks and with several "Bon journee's" from the deck crew. This could be because i appear to be the youngest passenger on the whole ship and one of the few not wearing grey slacks. my yellow jacket contrasts nicely. Passport check and the immigration man asked me my destination. Ithought about saying Romania but decided Vienna would not elicit as many questions. Found my way out of St Malo via the back routes as planned and via a circuitous route I got to the D 73. The journey proper begins! It's Monday so everything in France is closed but I did manage to find a boulangerie for a mid morning break. 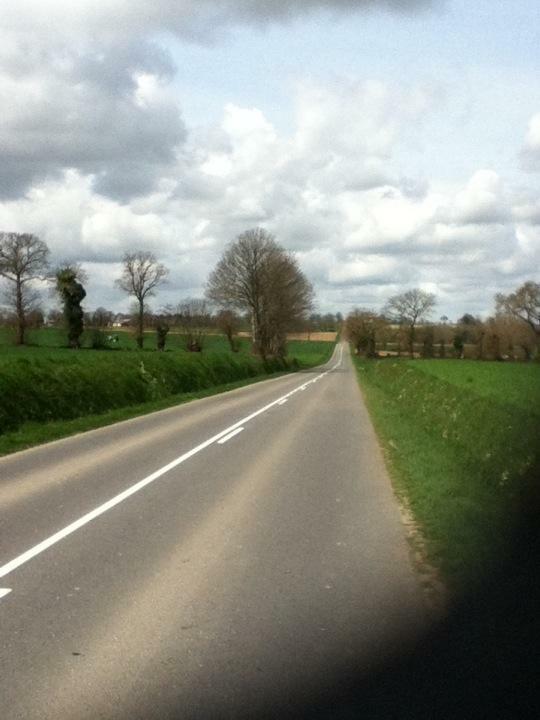 Made fast progress on quiet roads across the rolling Brittany countryside, tractors are the main hazard. Looked for a place for lunch but the"ferme" signs are out in force. Arrived in my target village of st. Bretagne to find the auberge closed, in fact they have decided to outdo the others and close for two days. Luckily I'd spotted this on the web so I booked ahead for a chamber des hotes. Very pleasant but suspect getting a meal tonight will be a challenge, it is Monday after all. Ferme. Jenny Mottram (the other one!) A wonderful start for you in a beautiful country. So many long empty roads - perfect for cycling. Hope you get through France though before everything closes for the month of May!